It makes me incredibly proud that our little nation, that is approximately the same population and geographic size as the state of Indiana, has had such an impact across the world for so many generations. Our little island, formerly known as the land of Saints and Scholars, has delivered the world some amazing discoveries and technologies that have changed the world forever! For example, we created the submarine, the ejector seat, and an Irish man even discovered the cure for leprosy! But best yet, and I may be a little biased, we can’t forget Ireland’s contribution to the world of distilling! Whether you believe the old adage of the Irish monks spreading alembic alcohol distilling around the world or you’re just a fan of a disillusioned tax collector figuring out how to continuously distill, you can’t deny that the Irish have given the world’s whiskey lovers a lot to be thankful for! And it is this time of year, as we start to approach the feast day of the patron saint of Ireland that we prepare ourselves for the worldwide celebration of our amazing culture and history. And no celebration is complete without a taoscán or two of our native spirit! So whether you are thinking of picking up something new for yourself, or an Irish treat for that special someone in your life, here are a few of my choices for enjoying that Irish whiskey this Paddy’s Day season. The world of Irish whiskey is ever growing and the offerings on the back bar are ever growing, but if you’re looking for something to wet the whistle, why not check out these very cool independent bottlings? 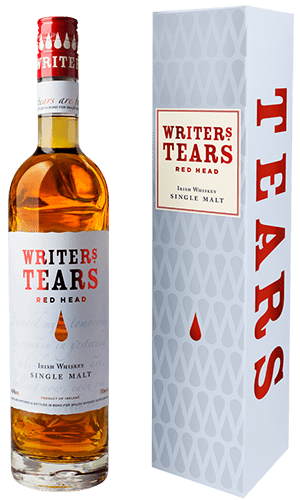 It is the only Writers’ Tears, so far, that has diverted from their Pot Still Blend recipe, and I have absolutely no problem with that. This bottling delivers an beautiful nose of rich dried fruits and berries with a hint of sweet malt and follows through with an amazingly creamy mouthfeel and flavours of deep dark fruits and a slight citrus tinge. A great addition to any Irish whiskey collection or home bar. 46% ABV (92 Proof) More Information. The Whistler is another single malt whiskey, which also features a lovely sherry forward complexity. As opposed to the exclusively sherry aged Redhead, the Whistler spent the first five years of its life maturing in ex-bourbon barrels, at which point it was transferred to Oloroso Sherry butts to quietly finish in for two more years. In my opinion, this whiskey, which was sourced from another distillery in Ireland, hits a natural sweet point at seven years. This is only exemplified with the two year sherry aging it received at the hands of the Boann Distillery company. The double maturation delivers a fascinating nose of delicious sherbet lemon coupled with a creamy salted caramel. The citrus follows through on the surprisingly dry palate, with hints of light pepperiness. The Blue Note has a set of flavours, unlike any other single malts on the market. They lightly linger at the back of the palate and create a great taoscán for sipping. Check out my thoughts on their full range here. kid on the block, that’s not all that new. Alltech founder Pearse Lyons**, fired up his stills in Carlow in 2012. It was here that he distilled a decent amount of Irish single malt whiskey, before silencing his stills until the opening of their new distillery home. Unfortunately for Pearse, their new home was also reclassified as a protected building, and their completion schedule was pushed back by a few years (and a few quid too, I’m sure!). The distillery was finally completed in the deconsecrated St. James’ Church in Dublin. The distillery’s opening was coupled with the release of four whiskeys baring the Pearse Lyons name. What is truly intriguing is that these newly released whiskeys all bare some of the fruits of his Carlow distilling venture in 2012. The Distiller’s Choice is one of my favourite offerings from this new range. This is a 4-9 year-old blend made up of 7 different Malt and Grain Whiskeys (38% Malt / 62% Grain). The Whiskeys in the Distillers Choice were aged in a combination of Bourbon, Sherry and Kentucky Bourbon Barrel Ale barrels (from their sister distillery in Kentucky). It is a very fascinating new entrant to the Irish whiskey market and offers something that no other independent bottlers can boast; a mixture of their own malt as well as sourced malt and grain. In my opinion, the palate features a menagerie of caramelised and stewed fruits, with a undertone of creamy cocoa, delivering a new flavour wheel to sourced independent bottles. All the Pearse Lyons whiskeys are non-chill filtered and are bottled at natural colour. This edition is 42% ABV (84 Proof). More information here. **Pearse Lyons sadly passed away on March 8th, 2018. Our thoughts are with the Lyons family, friends and those in Alltech who have lost a very courageous and ambitious President. This book certainly delivers on its biography. Fionnán is arguably one the foremost authorities on Irish Pot Still whiskey in the world. In this book, he dives into the romanticised history of what was once the most popular whiskey style in the world. He then breaks down the entire whiskey making process and details just what makes Irish Pot Still Whiskey so unique. Fionnán’s passion for the industry led him on a several year voyage of discover all over the island of Ireland. He spent his time interviewing industry greats, and documenting tasting notes for some of the rarest, Irish whiskeys left on the island, many of which are almost completely forgotten. I once read a book review in the Irish Times that coined the term “unputdownable” and I think it would only be fair to revive this term for Fionnán’s publication. What I love about this book is that it is incredibly informative and a very easy read. You can pick this book up and read it cover to cover like a story book or even dive in to chapters you know little about and use it as a reference tool. Furthermore, one of the greatest assets that this book possesses is that it does away with the generalised explanations and fallacies about Irish whiskey and carefully details what actually happened and how these generalisations came about. This is a great book to really jump into, especially for those new to the category. A top pick in my book, pardon the pun. This quarterly series is a true work of passion by Chief Editor, Serghios Florides. He has created a beautifully crafted magazine series that is filled with articles that are penned by enthusiasts, brand ambassadors, master distillers and everyone in between. Their articles tackle issues in every facet of the industry, leaving you never feeling like any two issues are alike. You can find articles that delve into the rich history of the country’s national spirit, sharing an insert detailing interviews with the newest movers and shakers in the industry and everything in between. This is a perfect addition to any whiskey fan’s reading collection, whether you are a complete novice or distilling specialist, there is something here for you. Each article is only €10, the annual pass is €40 or treat that whiskey enthusiast in your life to a limited edition gift box that includes a subscription to the first 8 fantastic issues for just €79.95. Check out their gift store, here. Why not continue your whiskey knowledge voyage past Saint Patrick’s day and explore the world of Irish whiskey all year through. Whiskey societies are a fantastic way to stay up to date with the movings and shakings of the industry in Ireland. Join lots of equally enthused individuals to explore your way through a variety of tastings, distillery tours and events. The Irish whiskey society is the largest whiskey society in Ireland. It boasts monthly tastings, whiskey walks, distillery visits and annual society whiskey bottlings. Society branches exist in Dublin, Dingle and even in the USA. More details here. Cork whiskey society is a fantastic society which meets in the heart of Cork city every month. This society boasts monthly tastings and numerous distillery visits. At these tastings you will learn about the rich history of Irish whiskey, they often feature some fabulous and rare Irish whiskeys that are often prohibitively expensive Irish whiskeys that are often out of reach for the individual consumer. More details here. If you aren’t able to make monthly tastings in Ireland, fear not! The Celtic Whiskey Club holds bi-monthly Tweet Tastings which involve Irish whiskey lovers from all over the world! Membership entitles Irish whiskey lovers to receive samples of exclusive and rare whiskeys and even voting rights in the annual Irish Whiskey Awards! More details here. This one requires some full disclosure. I haven’t actually used one of these glasses yet although it features here because I think the concept is very cool. My interest in this product itself is that it is attempting to being the quintessential Irish whiskey nosing glass. They start this journey with their name, “Túath” which means nation in the Irish language. Túath Glass. Photo rights Irish Whiskey Glass Ltd.
As we look past the name, the glass has apparently been designed specifically to enhance and complement the intricate aromas of Irish whiskey. While many other whisk(e)y nosing glasses also utilise a conical shaped body, the flared brim is designed to disperse some of the harsher ethanol notes in your uisce beatha Éireannach. The stem itself is designed in the style of the iconic Irish landmark Skellig Michael (which was featured heavily in the recent reboot/continuation of the Star Wars franchise). Not only is this a nice tie into their Irish theme, it also appears to deliver good purchase for your hands while using the glass itself. Form and landscape in one.